When travelling, clean water is not always available. In some parts of the world such as Africa, the Middle East and Asia, it may be difficult to regularly obtain clean water. Sources of water can be polluted with microorganisms such as bacteria and parasites. Water may also be polluted by chemicals. Therefore, you need to pay attention to the water you drink. In many cases, it is preferable to combine two methods to make sure that the water is treated for all types of microorganisms. For instance, filter the water before boiling it. Water that has been purified must be stored in a disinfected and closed container. To clean your container, you can wash it with purified water or sterilize it in boiling water (if the container material allows). Also wash all the container caps with treated or boiled water. Collect water as far away from polluting activity or chemical spills as possible. Avoid using stagnant water since it generally contains more microorganisms. Choose water that is as clear as possible. Collect the water upstream from human activity. 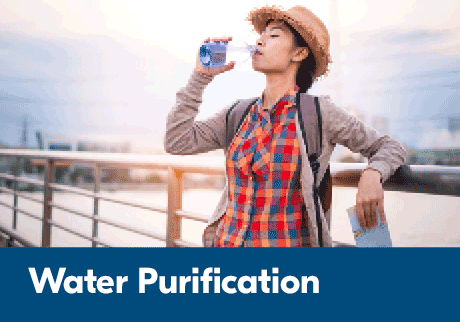 When water contains particles, it is preferable to pre-filter or clarify it before treating it. Place the water in a container and let it sit. The suspended particles will settle at the bottom of the container. If the particles are small and light, the process may be longer. Run the water through a filter (such as a coffee filter, T-shirt, etc.) other than the filter for removing microorganisms. This process is especially useful when dealing with very small and light particles.